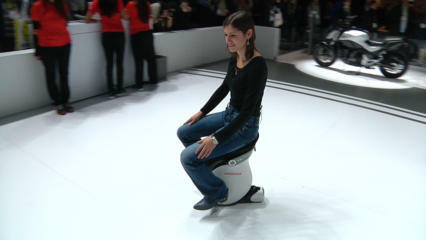 Honda's self-balancing Uni-Cub personal transporter is a fun way to get around. Never mind that your probably need some exercise, the Uni-Cub will scoot you to your destination at 4 miles per hour, no effort required. Steering is as simple as moving your weight in the direction you want to go and the thing keeps upright thanks to balancing technology first developed for Honda's Asimo humanoid robot. At CES in Las Vegas, Honda was offering Uni-Cub test rides so we hopped onboard.